Spider Index Lynx spiders pose little danger for humans. Although there have been a few cases of human envenomation, the bites do not cause much more than temporary pain and swelling at the site, and no tissue damage or aftereffects. 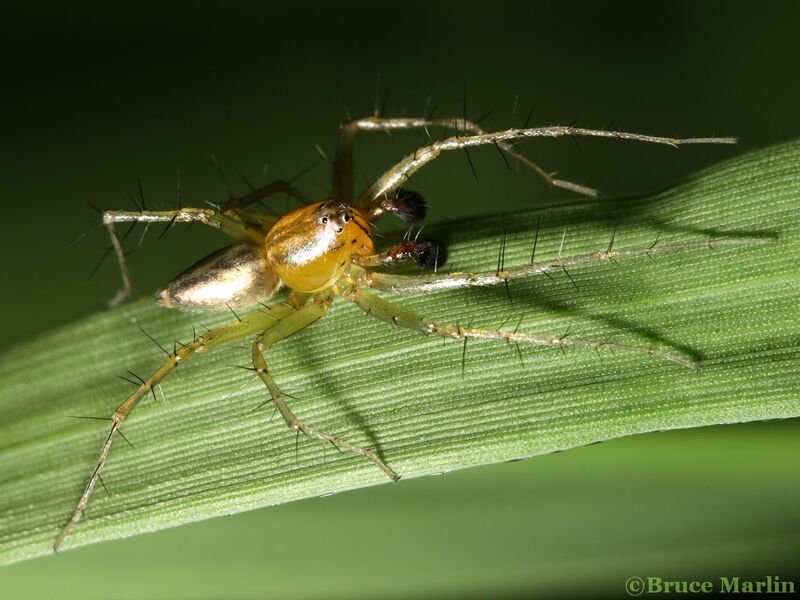 Little is known about the chemistry of lynx spider venom, but it has been discovered that P. viridans, alone among spiders, is capable of ejecting its venom in a forward-pointing spray which can reach a distance of 20 centimeters (about 3/4 inch). When the spider is assaulted, say, by grasping one of its legs with a forceps, it whips around to face the offending instrumentation and forcefully discharges the venom in multiple directions from its fangs. Nothing is known about the defensive effectiveness of this procedure, or whether the spider also uses it preemptively. Lynx spiders, like all others in the family Oxyopidae, are diurnal, that is, they hunt during daylight hours. Their hunts are conducted much like those of the jumping spiders (Salticidae); they roam low foliage, leaping about looking for prey items. They trail a dragline when leaping, but never construct webs for prey capture. 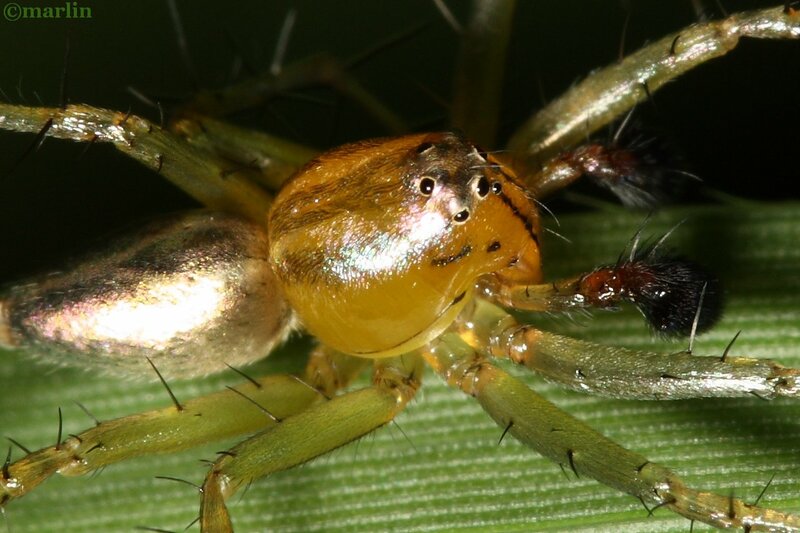 Their eyesight is not as keen as the jumping spiders, and they more often use the “wait and pounce” hunting tactic most often associated with the (equally well) camouflaged crab spiders, Thomisidae. Oxyopids of North America are characterized by the presence of numerous large, erect spines on the legs and their erratic and sudden movements. Lynx spiders are among the major predators of insects low shrubs and grasses. Few detailed observations have been made on the feeding habits of lynx spiders, but investigations by W.H. Whitcomb have disclosed that the lynx spiders are important predators of crop-damaging insects. In the field, green lynx spiders have been observed feeding on many species of moths of the families Noctuidae, Geometridae, and Pyralidae, including some of the most important crop pests. Oxyopes salticus, one of the most common spiders in Arkansas cotton fields, has been reported as the chief predator of the bollworm, Heliothis zea.Peucetia viridans also preys on this pest.